I get lots of CDs from musicians I've never heard of, but this is the first time that one knocked me out to the point where I added the band to my roster. The Early Years has all kind of songs on it - standards like That Old Black Magic and Gypsy In My Soul, clever catchy originals with worldwise lyrics, jazzy covers of rock classics like Sunshine Superman and Burning Down The House - all delivered by one of the hippest, tightest sextets around, featuring one of the most relaxed, sexiest vocalists I've heard in MARILYN OLDER. Leader CHARLIE BARNETT doubles on guitar and piano and GARY GREGG plays multiple woodwinds, so the group, which also includes trombonist JOE JACKSON, bassist PETE OSTLE and drummer TOMMY BARRICK, actually sounds bigger. 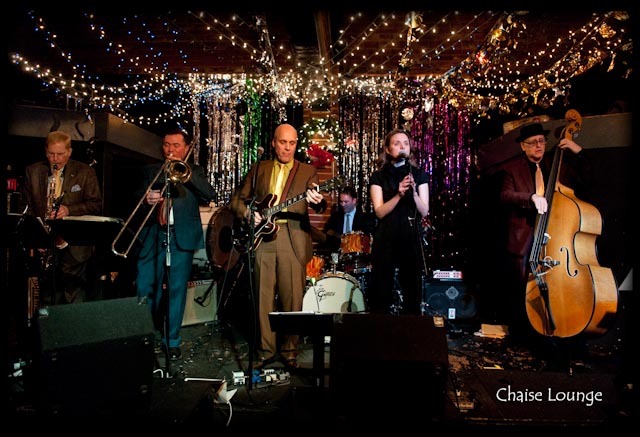 Thanks to an NPR feature on Weekend Edition and impressive word of mouth from their large and loyal fan base (the Kennedy Center chose them to perform for 7000 people at their New Year's Eve gala), Chaise Lounge is gradually extending their range well beyond their Washington DC home area. Their followup CDs Second Hand Smoke, Insomnia, Dot Dot Dot, Gin Fizz Fandango, and their latest, The Lock and The Key, prove once again that CHAISE LOUNGE truly defies category, and defies the audience not to have a truly wonderful, fun time.